Shri Raghunatha kirti Adarsha Sanskrit Mahavidylaya (Estd.1908), Devaprayaga, Uttarakhand was taken over by Rashtriya Sanskrit Sansthan on 16th June, 2016 as its 13th constituent Campus. 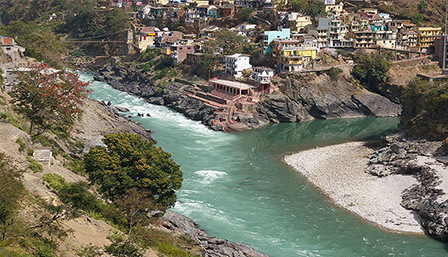 Like the former Mahavidyalaya, the campus is also named after the famous ancient deity Shri Raghunathaji shrined in the ancient Raghunatha temple constructed in the Katyuri style of Katyuri dynasty of the mountains on the holy confluence of two important mythological rivers, namely, Bhagirathi and Alaknanda from where exactly the river Ganga is believed to be originated. So far as the geographical, historical, mythological and educational status is concerned, Devaprayaga comes in the state of Uttarakhanda (formerly Uttaranchal and still formerly Uttarpradesh ) which is popularly and culturally known as Devabhumi or the divine land. This state of Devabhumi is adorned not only with one of the famous Jyotirmathas called Shribadrikashrama but with one of the twelve jyotirlingas, namely, Shrikedarnatha. The province has the credit of being the sources of two vedic as well mythological rivers Ganga and Yamuna. Even today also the divine-soul (devatatma) Himalaya stands here as the measuring pole of the earth as if to glorify the state. According to the Kedarakhanda of the Skanda-Purana, the name Devaprayaga came into existence on the very name of the sage Shri Devasharma who has undergone a severe penance in this auspicious place. Devaprayaga has the credit of being recognised as the first prayaga among the five prayagas of Uttarakhand, followed by Rudra prayaga, Karna Prayaga, Nanda prayaga and Vishnu prayaga respectively. The small but important city Deva prayaga is surrounded with atleast three series of mountains, namely, Griddhachala, Dasharathachala and Nrisimhachala etc. The Nrisimhachala part of Devaprayaga was famous earlier as a centre of learning in entire Uttarakhanda being categorically named as vidyakshetram. It is the only state where Sanskrit is accepted as its second official language. Because of this cultural, spiritual and educational background, the above campus was inaugurated here on 16.06.16 by Mr. Mantriprasad Naithani, the Hon'ble Education Minister of Uttarakhand in the precious presence of Prof. P.N. Shastri, the Vice chancellor of Rashtriya Sanskrit Sansthan along with M. K. Dhyani, the Ex Rajyasabha Member and Mr. Rajendra Kotiyal, the Suchana Ayukta, Uttarakhand. The former Sanskrit Mahavidylaya has donated its premises with a vast land measuring 3.443 hectares and simultaneously the Govt. of uttarakhand has also allotted some adjourned portion of land measuring 9.228 hectares (total 23 acres).The land for the lay-out plan for the construction work of the campus building is already assigned to CPWD (Shrinagar Branch) and the process has been promptly started after assessing the types of required blocks including Academic, Administrative and residential (Hostel for Boys and Girls both, Guest House and several types of Staff Quarters) with the consultation of the concerned committee members of the Campus . The newly established campus now functions with five departments (Vyakarana, Jyotisha, Sahitya, Veda and Nyaya) and it runs in the earlier constructed limited space of the former Mahavidyalaya with around hundred students admitted to different classes of Prak Shastri, Shastri and Acharya level. Here the regular teachings to all the subjects are being imparted to those bonafied Students by fifteen well -versed teachers of different disciplines. Besides, the modern Subjects like Hindi, English, History and computer science etc. are also being taught along with traditional subjects up to graduation (Shastri) level. Shiksha Shastri (B.Ed.) course is also to be started here in next academic year 2017-18 which is specifically meant for the training of Sanskrit teachers. Time to time the Campus also organizes National Seminars, Work-shops and Extension Lectures etc. departmentwise. Besides, the campus is committed to offer research programmes obviously leading to the award of Vidyavaridhi (Ph.D.) degree in forthcoming years. At present a research project runs here which is in progress and some research students are also transferred to continue their ph.D. works. The campus has also undertaken a non–formal course of Spoken Sanskrit to enable the students to speak Sanskrit fluently. The campus is planning to develop a rich library of books and manuscripts (also in digital form).To start with, at present the library has more than 1000 books to its credit. It is proposed to publish three Research journals and periodicals from the campus in current year. An annual International Research journal, namely, ‘Devabhumisaurabham’, an annual campus journal, namely, ‘Raghunathakirtipataka’ and a quarterly Newsletter, namely, ‘Raghnathavartavali’ will be published shortly.